Leucoderma is a cutaneous disorder in which the skin loses part or all of its pigment in spots, causing white blotches, or lesions. It is also known as Vitiligo, however, Vitiligo is a type of Leucoderma, therefore the terms are not completely interchangeable. Leucoderma is non-contagious. The areas that lose pigment are not painful, nor will they cause harm, but the lesions are quite noticeable, especially on individuals with darker skin tone. The victim usually suffers embarrassment and depression, especially if the spots are on the face or hands. Pop superstar Michael Jackson was a victim of Vitiligo. Leucoderma usually commences with the development of multiple white patches on the body. The white patches may grow and change shape or they may remain the same size. Frequently, sufferers will experience cycles with dormant periods when the lesions remain stable, followed by times of growth. These cycles are unlikely to end and any skin that loses its pigment will usually not regain it on its own. While the depigmentation may occur anywhere on the body, it is most often found on the hands, feet, arms, legs and face, especially near the mouth and eyes. It can affect the eyes and any part of the integumentary system, which includes hair, skin and nails. Vitiligo Universalis covers the entire body. 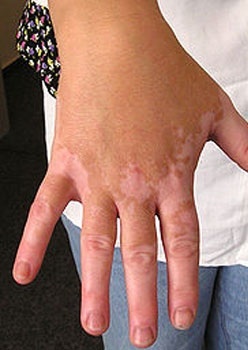 Non-segmental Vitiligo has symmetric patches on either side of the body. Segmental Vitiligo spreads faster and seems to focus its attack on skin having dorsal roots from the spine. Those with a family history of Leucoderma or auto-immunity diseases are more likely to experience it. Leucoderma is caused by the death of melanocytes. Melanocytes are the cells that make melanin, the pigment that gives our skin its color. However, why the melanocytes are destroyed is unknown. It has been noted that neuropeptides reacting to skin abrasions, burns or inflammation may cause the depigmentation, implying multiple causes in sequence. However, it has also been suggested that stress may trigger the hypothalamus to initiate reactions in the thyroid or elsewhere that may cause the destruction of the melanocytes. Leucoderma is a rare condition, affecting less than two percent of those in the U.S. Auto-immune thyroid disease may be a cause of Leucoderma, as could genetics. It usually presents early in life with most cases beginning between the teenage years and age 30. Only five percent of Leucoderma sufferers develop the disorder after age 40. It is equally likely in men and women. Excessive guilt, grief, or depression may be a trigger, causing the hypothalamus to stimulate the pituitary and adrenal glands, as well as thyroid hormones, mimicking hypothyroidism. Extremely tight clothing, especially at the waist, may also be causal. Wearing tight rubber gloves also has a negative effect, perhaps from latex allergy syndrome. Preventive therapy can alleviate the severity and slow the spread of Leucoderma. Use a strong sun block on the white patches to avoid further aggravation from sunlight. Wear a wide-brimmed hat and long sleeves when outdoors. Switch to vegetarian foods. Non-vegetarian foods have been observed to slow recovery. Avoid overly sour foods. The acetic acid in sour foods restricts the production of melanin. Your physician can diagnose Leucoderma easily during a routine physical exam but it’s likely you have already self-diagnosed the condition. In addition to a regular, annual wellness test, it’s recommended that sufferers have a thyroid panel performed every six months to monitor the thyroid’s health. Hyperthyroidism can be a consequence of Leucoderma but it is also suspected to be causal in some fashion. Treatments may be homeopathic, herbal, pharmaceutical or surgical. Herbal remedies might be applied topically or ingested as a tea. Their effectiveness is a matter of debate. Some sufferers experience relief of their symptoms and some do not. There are web sites with ratings of the various home remedies. Most of the herbal remedies have patients who claim to have been cured. Reversal of the condition is rare, and although these remedies claim to promote repigmentation, clinical studies do not support or refute their claims. However, if the patient believes in the treatment’s efficacy, then it is more likely to succeed, if for no other reason than continued use of the treatment. Treatment is based on a total examination of the patient, including genetic, emotional, mental and physical, as all aspects may have an effect on Leucoderma. Of the dozens of possible ingredients, a treatment may include arsenic sulph falvus, arsenic album, baryta muriaticum and baryta carbonicum. Homeopathic treatments are meant to correct what is believed by homeopathic physicians to be an outward manifestation of an internal malady. If the body can be returned to its healthy state, the Leucoderma will disappear. Because the treatment is tailor-made for the patient, it may take a few versions before relief begins. Full treatment may take years, so the patient must be willing to form a cooperative partnership with their homeopathic physician to realize success. Leucoderma can be accompanied by numerous complicating factors like stress, hyperthyroidism, anemia, and intestinal disorders. Homeopathic treatment treats any associated problems at the same time. Herbal treatments are all natural, with no side effects and minimal cost. These home remedies have both skeptics and believers. Store water in a copper pitcher overnight and drink it the following day. Do this for six months. Symptoms will gradually diminish. This works by stimulating the melanocytes to begin producing melanin. Mix a few drops of basil extract and lime juice. Apply to the affected area three or four times daily for six months. Symptoms will diminish in one month and disappear in six months. Basil extract and lime juice are both known for stimulating melanin production. Soak psoralea seeds in ginger juice for three days. Then dry and powder them. Add one gram to one cup fresh milk and drink daily for two months. A paste made from the ground seeds can also be applied to the white patches. Symptoms diminish in two months. Mama-cadela, or Brosimum gaudichaudii, comes from the savannas of Brazil. It has dark-green leaves with sweet yellow fruit. Boil a tea from the root and skin. Apply it as a warm compress to the patches. The symptoms will diminish in one week. Soak tamarind and psoralea seeds in water for four days. Dry the seeds and smash them into a paste. Apply the paste to the lesions daily for one month. The symptoms will gradually diminish and then disappear. Take about one ounce of radish seeds and crush them in two teaspoons of vinegar. Apply to lesions for 6 months. The lesions will disappear. To 250 ml of pure mustard oil, add five teaspoons of ground turmeric. Apply to lesions for six months to one year to make the spots disappear. Eating chick peas and applying a paste to the lesions will promote repigmentation. Piperine is a chemical made from black pepper. It may shorten the repigmentation process. Ginkgo Biloba has been touted to help many conditions, but the testing has been suspect and never reproduced. However, when taken with L-Phenylalanine, Ginkgo Biloba seems to have an effect on Leucoderma. There are no effective pharmaceutical treatments. Hypertension should be corrected, as it may aggravate Leucoderma. Depression should also be cared for, as it too may advance the condition. Treatments with steroids like cortisone should be avoided as they may have worse side effects than Leucoderma. Cortisone/steroids treatments may cause a swelling of the face known as moon-face. It can also have other adverse side-effects like arteriosclerosis, diabetes and high blood pressure. In some cases, the pigment can be removed from the rest of the skin to achieve an overall consistency of tone. This process takes a year and is one method of concealment or camouflaging the condition. UV light therapy is also used to treat the white patches, to re-pigment them. Transplantation of melanocytes to the lesions has been successful at repigmenting the region. Melanocytes were removed from a layer of normal skin and grown in culture. The lesions were abraded and the melanocytes were then transplanted to the affected area. Around 75 percent of the procedures performed were successful, with full repigmentation of the lesions, although the duration varied from patent to patient. Ultra-Violet light treatments may be administered to attempt to smooth out the tone of the skin by repigmenting the white patches. After taking medications to sensitize the skin to light, the skin is exposed to UVA rays twice weekly for up to a year. Side effects include localized sunburn and skin freckling. UVB treatments, with narrowband Ultraviolet B, take as long and as often to complete, but skin conditioning prior to treatment is not necessary. Cuban doctor Carlos Miyares Cao developed Melagenina, which allegedly has had success treating Leucoderma. It is not available in the U.S. and many other countries. It’s is made from human placenta and calcium chloride, which is known to stimulate melanocytes, aiding repigmentation. Leucoderma doesn’t discriminate. These famous people are all sufferers of either Leucoderma or Vitiligo. Michael Jackson had Vitiligo from 1986 until his death in 2009. The white spots were rumored to have begun his wearing the signature sequined white glove. Prince Michael Jackson I, his son, inherited the disease. Amitabh Bachchan, the famous Indian actor, suffers Vitiligo. Graham Norton’s hair has white patches from Vitiligo. Lee Thomas, news anchor for WJBK Detroit, suffers Leucoderma. Singer/rapper Krizz Kaliko named his first album after the condition, Vitiligo. Reno 911! star Thomas Lennon has Vitiligo. Charly Garcia, Argentinean rock musician, has Vitiligo, as evidenced by his two tone moustache. Dallas County Commissioner, John Wiley Price, is slowly turning white from Vitiligo. Boston Celtic Rasheed Wallace suffers from Vitiligo. Tempestt Bledsoe , an American actress, suffers from Vitiligo. Gautam Singhania, the chairman and managing director of Raymond Group, underwent complete depigmentation for his Vitiligo. Asifa Bhutto Zardari, the daughter of Pakistani President Asif Ali Zardari and former Prime Minister of Pakistan Benazir Bhutto, has Leucoderma. Eduardo Panlilio has Vitiligo. He’s the Governor of the Philippine province of Pampanga. Yvette Fielding, British TV presenter, developed Vitiligo when she was eleven. Her mother developed Vitiligo when 24. Mikel Jollett lead singer for rock band The Airborne Toxic Event has Leucoderma. Fez Marie Whatley of the The Ron and Fez Show XM 202 suffers from Vitiligo. Scott Jorgensen – Former Pac 10 wrestling champ and current mixed martial artist with WEC. i am very happy about this effort for leucoderma cure. i have leucoderma since last 8 year , please give any solution or suggest any medicene.if u know any better solution please send it to my mail. i am very happy about this effort for leucoderma cure. i have leucoderma since last 15 year , please give any solution or suggest any medicene.if u know any better solution please send it to my mail. I have lucodetma since 18 years. pls tll me any suggestion to reduce this disease. kya iska color matching k through treatment h? i am very happy about this effort for leucoderma cure. i have leucoderma since last 7 year , please give any solution or suggest any medicene.if u know any better solution please send it to my mail. I HAVE LEUCODERMA ( VITILIGO )FROM LONG TIME. WHICH HOMEREMEDY CURE VITILIGO FROM FACE QUICKLY? Sir, please guide me, what can i take for this? Suffering from last 8 years.First appeared on the stomach.It is spreading all over on legs,hands,stomach.Now on the lips.Will almond oil mixed with clove oil in equal proportion be effectfull.Which is the best method in home remedies.pl.do ml.me. suffering from last 20 yrs.First appered on the legs,It is spreading all over on hands,stomach,lips so please you give me suggetion which is the best method in home remedies.please do mail me. i have suffering from leucoderm..since for last 5 year..
i am very happy about this effort for leucoderma cure. i have leucoderma since last 1 year , please give any solution or suggest any medicene.if u know any better solution please send it to my mail.